The International Festival and World Cup Tournament features music, dancing, food and plenty of soccer. Events will be held on McDonough Field, weather permitting, or in the Woodruff PE Center in case of rain. 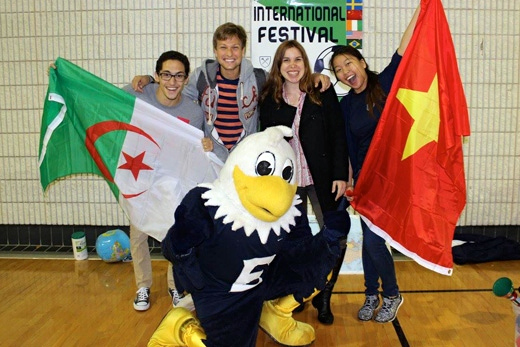 The International Festival and World Cup Tournament, created to celebrate the Emory community’s diversity through food, music, and friendly soccer competition, will be Friday, April 1, from 6-9 p.m. on McDonough Field. This is the third year for this event, which last year drew about 700 attendees, according to Natalie Cruz, director of the Office of International Student Life, which sponsors the festival and tournament in collaboration with Emory Recreation and Wellness. "The International Festival and World Cup Tournament continues to grow and is becoming a signature event on Emory's campus in the spring," Cruz says. "The hope is that attendees from the entire community can join together to celebrate the incredible cultural and national diversity that is found at Emory through music, food, art, sports and friendship." Around the soccer matches in the center of McDonough Field will be music, dancing and tables representing the different countries in the World Cup competition; countries represented by students at Emory; and international and cultural student organizations. There will also be international food, giveaways and activities throughout the festival and tournament. "Our hope is that events like this can serve to bring awareness, deepen understanding, and open minds to the beauty that is found in other cultures. Through this event, you truly can explore the world at Emory," Cruz says. More than 20 organizations, 24 soccer teams, and six performance groups have already signed on and more are being added daily, she notes. In case of rain, the event will be held in the Woodruff PE Center. Get more information about the event and see other sponsors on the OISL website and Facebook page, where you can also see pictures from last year’s festival.